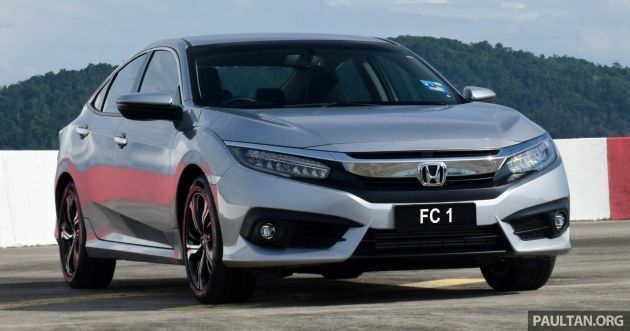 Looking for the perfect number plate for your tenth-generation Honda Civic? Then you’ll be pleased to know that the Road Transport Department (JPJ) has opened tenders for the FC number plate series, with biddings to close this Friday, April 19, according to the News Straits Times. The introduction of the new series comes about a year after the previous FB series, as promised by the authority then. In a new development, buyers are now able to bid for their ideal number plates online via an e-bidding system, as part of a JPJ pilot programme. 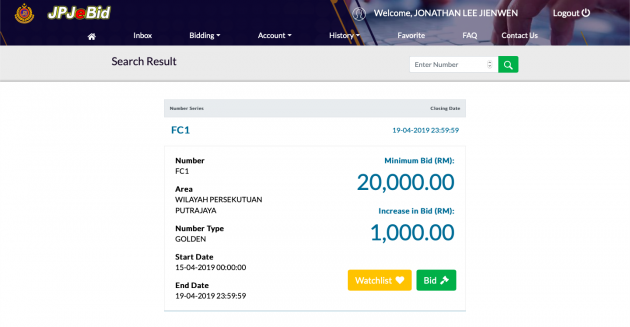 “This [e-bidding for FC series] is a pioneer project [by JPJ] and the process ends on April 19 at 11:59 pm,” said transport minister Anthony Loke, adding that the official results for successful bidders will be announced at noon the next day. Perusing the website, it appears that there are four types of numbers – running, “popular” (double-digit, certain triple-digit numbers), “attractive” (matching digits) and “golden” (single-digit numbers) – with bids to start at RM300, RM800, RM3,000 and RM20,000 respectively. Bro, when can we have a online complaint system where we can post heavy lorries on the highway during peak hour? Don’t know why this year suddenly i see so many…even more than buses on the highways. I agree with you. Too much of corruption in JPJ. Every morning got so many tractors, lori pasir etc going with the rush hour traffic at 7.30 am. Same story, different excuses. Same sh-t, different smell. The FC is already in the market for more than 2 years and will be going through a facelift. the owner can keep it for 2 years and next thing, the FC number plate is “outdated” once a newer Civic is here. At least the winning tenders goes directly to gomen, no more masuk bank account crony abang adik. TQ YB Anthony for making sure those cronies no longer cheat the rakyat. Last time JPJ tenders go into cronies accounts? which one? This is very serious… how come it was not reported, unless someone took over? Should put highest bid so people will know what’s the current bidding price. Plus after bidding, no notification of being the top bidder or something. I disagree. From where I stand, those middlemen/agents or what i like to call “bloodsucking leeches” can kiss goodbye to their “Easy Cari Makan” habits. It is tamper proof. Heck, we should even call it Corruption Proof as well. You see, all the money goes directly to JPJ. We should celebrate. No more tolls, no more middlemen. Unless you can prove that this JPJ e-bidding System is owned/managed by few shady individuals or cronies who are not JPJ themselves, only then I’ll agree with your argument. Cheers. Someone manages the system. That someone is human with all of humanity weaknesses. There is no such thing as a foolproof system. Interesting. I registered for the system, and bid for a number. Very efficient; if I bid lower than highest current bid for the said number, it will say so, allowing me to bid higher. Also, when your bid is beaten by someone, apparently system will alert you (on the portal itself). This means that real bidders can really get their own numbers without using agents which charge a crazy fee. Very soon some agents will cry foul as their source of income is cut. One bad thing: THE ENGLISH ON THE SYSTEM (FAQ) and on their emails to you is ABSOLUTELY ATROCIOUS. How do you know that you are the top bidder? Is it refer to the ranking? If rank 1 you are the top bidder?